Hi all, looking for to get a one or 2 would be nice of the Acto Power pink off roader motors, looking for the original and or the re-re, i have lots of tamiya goodies to offer in exchange including new in package TRF tuned Acto Power, lots of tamiya batteries 1700SCR,SCRC,SP, etc. Holy jeebuz so many old battery’s to take to the tip... I can see you could be reluctant to take up lipo’s? or have a old battery hoarding fetish.. or you just collect stuff with Tamiya written on it like the rest of us. 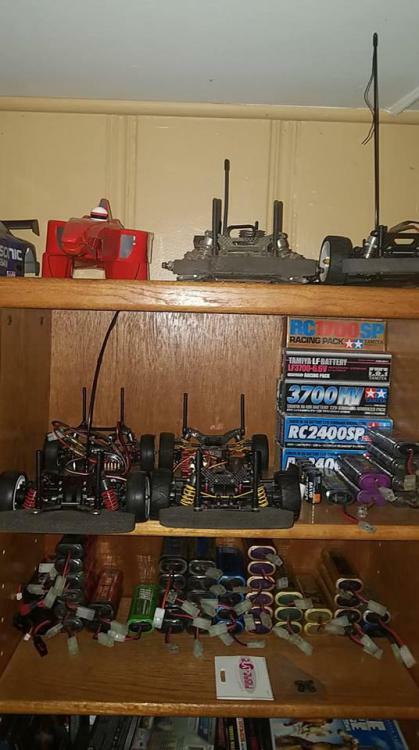 had 2 till i tried to charge/use the other, she had a slow death, it was painful to watch being one of the rarest tamiya packs i have come up on, still need the 1400scr and the sayno 3300hv...anyone? Would you have a nice NIB example for sale in the future, perchance? The last one I saw for sale had a seriously battered box, no telling if the battery inside was still ok, and they wanted stupid money for it. i have a few 2400's and few boxes, all are used some more then others, a couple look pretty new.